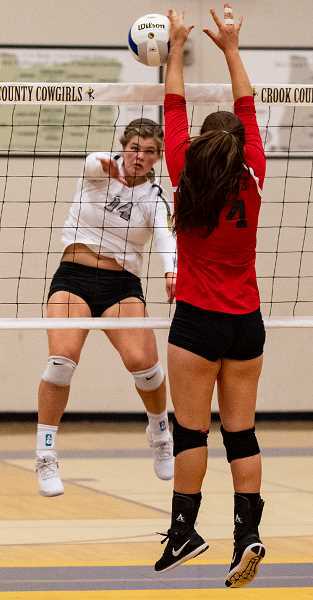 The Crook County Cowgirls looked poised and confident as they rolled to an easy straight-set victory Tuesday night over the Madras White Buffalos in their first home volleyball match of the year. "I think that was a really good show of what we have been working on in practice," head coach Baylee Dunkel said. "Speeding up our offense, playing to our ability level every time, and staying intense and communicating no matter what the scores. All that stuff that we have been working on in practice was pretty good." With the win, the Cowgirls remain undefeated on the season and have moved to second in the OSAA power rankings. The Cowgirls never trailed in the match as they rolled out to big early leads in all three sets en route to a 25-6, 25-10, 25-8 victory over the White Buffalos. "It starts to get hard to not lose focus a little bit in a match like that," senior outside hitter Kerigan Waibel said. "We start not paying attention as much as we really should, but I think that tonight we still played to our level, and that's something we have really been working on this year. Even with our subs in, we kept the other team to 10 points or under all three games, so we did a really good job." With Raegan Wilkins doing most of the damage offensively, the Cowgirls rolled out to an early 7-2 lead in the opening set of the match. The Cowgirls extended their lead to 16-6 before closing out the set on a 9-0 run. 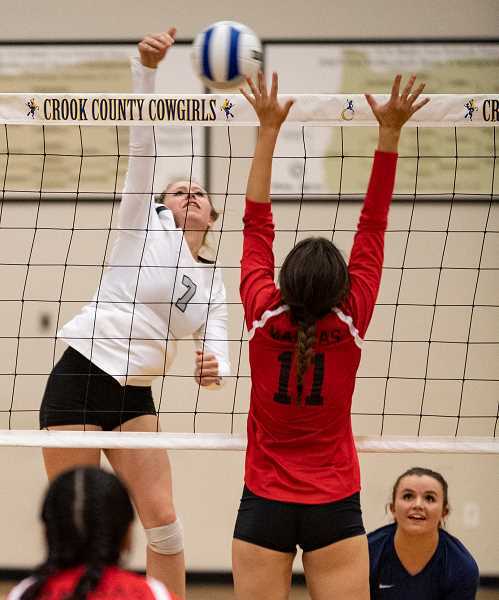 Wilkins, who led Crook County with eight kills on the night, had five in the first set alone before playing sparingly the rest of the evening. Set two started even better for the Cowgirls. Following a Madras serving error to start the set, Mekynzie Wells served eight consecutive points, including a pair of aces, as Crook County rolled out to a 9-0 lead. From that point on, the Cowgirls substituted freely, playing their entire bench as they experimented with setting players who rarely get hitting opportunities. With the team hitting on all cylinders, the Cowgirls ran out to a 17-3 lead before the White Buffalos made a late rally, closing to 22-10. However, a Madras service error followed by a pair of kills by Waibel closed out the set. Still playing their bench, the Cowgirls jumped out to a 5-0 lead in set three, then coasted to the easy victory. Once again, Wells went on a long serving spree, serving the final six points of the match, including four aces. For the match, Wells finished with 10 aces. She also led the Cowgirls in digs with four. Wells also did most of the service receive for the Cowgirls, passing nearly perfectly while handling 12 serves. As a team, the Cowgirls finished with an impressive dozen aces in the match. Setter Anna Woodward did a masterful job of directing the Cowgirl offense, spreading the ball around to a host of Cowgirls. "I thought it was a really good experience for the younger girls because it was an easier game, so they got a chance and some experience," Woodward said. "And they all played really well. I think that we started off really well, and we got a good run of points, which allowed the younger girls to come in and play, and they were able to keep it up." Crook County pounded 29 kills in the match, while limiting the White Buffalos to just four. Six Cowgirls had kills in the match. In addition to the eight kills from Wilkins, Waibel finished with seven, Kenna Woodward added six, and Lily Cooper finished with five. Liz Barker added two kills in just three attempts, while freshman Josie Kasberger picked up her first varsity kill. The Cowgirls also swept both the JV and freshman match against the White Buffalos. Crook County traveled to Eugene on Thursday, where they played Marist and Hidden Valley. Marist, a perennial top 10 Class 5A team, has dropped to Class 4A this year, while Hidden Valley has been a consistent Class 4A tournament team for the last 10 years. "Hopefully, the girls will stay in that mindset of being competitive and staying driven to win," Dunkel said. "That's what we have been working on in practice, is not letting anything affect us and keeping our errors to a minimum." Following Thursday's matches, the Cowgirls will host their annual Blue and Gold dinner and scrimmage on Tuesday, Sept. 11, then host The Dalles in the opening league match of the season on Thursday, Sept. 13. Tuesday's dinner will start at 5 p.m. with the scrimmage to follow at 6 p.m., while Thursday's match is also scheduled to begin at 6 p.m.